Looking at Message Delivery Reliability one might come to the conclusion that Akka actors are made for blue-sky scenarios: sending messages is the only way for actors to communicate, and then that is not even guaranteed to work. Is the whole paradigm built on sand? Of course the answer is an emphatic “No!”. or it failed due to a catastrophic VM error, e.g. an OutOfMemoryError, a memory access violation (“segmentation fault”, GPF, etc. ), JVM bug—or someone calling System.exit(). In all of these cases, the actor was very likely not in a position to process the message anyway, so this part of the non-guarantee is not problematic. It is a lot more likely for an unintended message delivery failure to occur when a message send crosses JVM boundaries, i.e. an intermediate unreliable network is involved. If someone unplugs an ethernet cable, or a power failure shuts down a router, messages will be lost while the actors would be able to process them just fine. This does not mean that message send semantics are different between local and remote operations, it just means that in practice there is a difference between how good the “best effort” is. To bridge the disparity between “local” and “remote” sends is the goal of this pattern. When sending from A to B must be as reliable as in-JVM, regardless of the deployment, then you can interject a reliable tunnel and send through that instead. 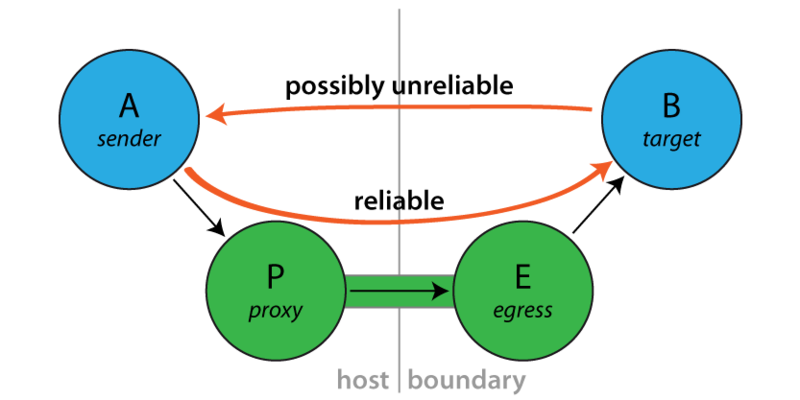 The tunnel consists of two end-points, where the ingress point P (the “proxy”) is a child of A and the egress point E is a child of P, deployed onto the same network node where B lives. Messages sent to P will be wrapped in an envelope, tagged with a sequence number and sent to E, who verifies that the received envelope has the right sequence number (the next expected one) and forwards the contained message to B. When B receives this message, the sender() will be a reference to the sender() of the original message to P. Reliability is added by E replying to orderly received messages with an ACK, so that P can tick those messages off its resend list. If ACKs do not come in a timely fashion, P will try to resend until successful. Sending via a ReliableProxy makes the message send exactly as reliable as if the represented target were to live within the same JVM, provided that the remote actor system does not terminate. In effect, both ends (i.e. JVM and actor system) must be considered as one when evaluating the reliability of this communication channel. The benefit is that the network in-between is taken out of that equation. The proxy tries to connect to the target using the mechanism outlined in Identifying Actors via Actor Selection. Once connected, if the tunnel terminates the proxy will optionally try to reconnect to the target using using the same process. Note that during the reconnection process there is a possibility that a message could be delivered to the target more than once. Consider the case where a message is delivered to the target and the target system crashes before the ACK is sent to the sender. After the proxy reconnects to the target it will start resending all of the messages that it has not received an ACK for, and the message that it never got an ACK for will be redelivered. Either this possibility should be considered in the design of the target or reconnection should be disabled. case "hello" ⇒ proxy ! "world!" Since the ReliableProxy actor is an FSM, it also offers the capability to subscribe to state transitions. If you need to know when all enqueued messages have been received by the remote end-point (and consequently been forwarded to the target), you can subscribe to the FSM notifications and observe a transition from state ReliableProxy.Active to state ReliableProxy.Idle. Set akka.reliable-proxy.debug to on to turn on extra debug logging for your ReliableProxy actors. akka.reliable-proxy.default-connect-interval is used only if you create a ReliableProxy with no reconnections (that is, reconnectAfter == None). The default value is the value of the configuration property akka.remote.retry-gate-closed-for. For example, if akka.remote.retry-gate-closed-for is 5 s case the ReliableProxy will send an Identify message to the target every 5 seconds to try to resolve the ActorPath to an ActorRef so that messages can be sent to the target. ReliableProxy.Unsent, see the API documentation for details. ReliableProxy.TargetChanged is sent to the FSM transition subscribers if the proxy reconnects to a new target. ReliableProxy.ProxyTerminated is sent to the FSM transition subscribers if the proxy is stopped. target is the ActorPath to the actor to which the tunnel shall reliably deliver messages, B in the above illustration. retryAfter is the timeout for receiving ACK messages from the remote end-point; once it fires, all outstanding message sends will be retried. reconnectAfter is an optional interval between connection attempts. It is also used as the interval between receiving a Terminated for the tunnel and attempting to reconnect to the target actor. maxConnectAttempts is an optional maximum number of attempts to connect to the target while in the Connecting state.